Singapore, 25 February 2015 – The Singapore Furniture Industries Council (SFIC) today officiates its first association-led overseas deal-seeking initiative for the Singapore Furniture Industry. Tapping into the Local Enterprise and Association Development (LEAD) programme run by International Enterprise (IE) Singapore and SPRING Singapore, SFIC will, for the first time, engage in-market consultants to help local small and medium enterprises (SMEs) seek deals in overseas markets. 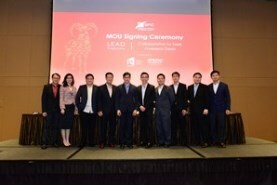 Nine furniture companies pledged their commitment to the programme and officiated the cooperation in a Memorandum of Understanding (MoU) Signing Ceremony held this morning at the Singapore EXPO, in the presence of Minister of State, Ministry of Trade and Industry, Mr Teo Ser Luck. The LEAD programme aims to enhance industry and enterprise competitiveness through partnerships with Trade Associations and Chambers (TACs), such as SFIC. Under the programme, TACs can engage in-market consultants to help companies seek deals overseas. Through this, SFIC will help the nine local SMEs seek deals in markets such as Australia, Europe and the Philippines. IE Singapore will fund up to 70% of the professional fees required to engage overseas consultants, for a three-year duration. As the custodian of the programme for the furniture industry, SFIC oversees all aspects of the initiative, including the selection of companies, planning and management of grant disbursement, as well as the screening and matching of overseas agents. Through this programme, local furniture and furnishings companies will be able to reach out to their target audiences within those appointed markets by tapping on the overseas in-market consultants’ networks and relationships, so as to uncover more opportunities for business expansion, including sales/export contracts, supplier/distributor appointments, and franchising/licensing opportunities. To ensure sustainability of the 3-year programme, SFIC has also established a framework to review programme progress and to measure customer satisfaction on the services rendered by the overseas in-market consultants, on a quarterly basis.